As Americans continue to struggle with outrageous, unstable gas prices, big oil continues to benefit from them. Last week, the five biggest oil companies reported a massive profits: $30 billion in first-quarter profits, a 38% increase from last year. Despite these astronomical profits, yesterday House Republicans voted unanimously (Roll Call 293) to block consideration of a Democratic proposal to end some of the tax breaks and subsidies we give to big oil every year. It’s outrageous that our government continues to reward these oil giants with an additional $4 billion a year of our money in tax credits and subsidies. Watch Rachel Maddow’s take (yesterday) on the volatile price of oil since 2000 and the GOP’s take from oil companies in terms of campaign contributions. It is a testament to the influence of polluters, and the power of the money they shower upon congress, that so many of our leaders have continued to defend these senseless subsidies. As recently as this March, House Republicans — while simultaneously pleading poverty and fighting for crippling budget cuts elsewhere — voted unanimously against repealing these oil subsidies, at a total cost to taxpayers of $45 billion over 10 years. One would think that in the face of huge budget cuts, painful gas prices and shocking oil company profits, that it might be getting harder and harder for Republicans to defend subsidies for BIG oil. Surprisingly, last week SpeakerJohn Boehner said that repealing oil subsidies “is certainly something we ought to be looking at” and that oil companies “ought to be paying their fair share.” While his statement was quickly walked back the next day by an aide, it’s clear that cracks are beginning to show in the Republicans’ brazen defense of senseless oil handouts. Indeed, five House Republicans have now said they would support eliminating these subsidies. House Minority Leader Nancy Pelosi yesterday announced a Democratic proposal to repeal oil subsidies, and in the Senate, Majority Leader Harry Reid will be unveiling a proposal next week. Momentum is building. This is a key moment to keep the pressure on, and force every member of congress to choose: Americans, or the oil companies? 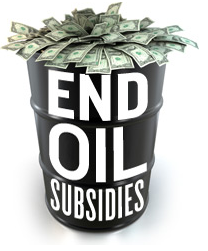 Tell Congress to end oil subsidies. This entry was posted in Energy, Issues, Subsidies on May 6, 2011 by NVRDC.